Human being is prone to diseases at all ages, but especially in old age, several other factors lead to suffering of health, such as physiological decline, process of degeneration & diminished resources. The socio-economic factors like retirement, loss of empowerment, loss of spouse, loneliness, change in social status also effect upon psychological and organic functions contributing in the decline of health. At the same time the busy lifestyle of young people & break down of joint families has compounded the problem of society's elderly. Within this setting "Aastha" intends to offer specially trained medical team who helps elderly patients to be as comfortable as they can be. Every person in our country has equal and ready access to the best information, treatment and care for life limiting illnesses - and where unnecessary levels of fear are set aside. 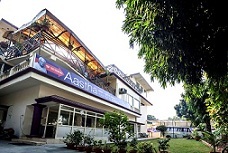 Aastha's team dedicates itself to working with others to turn this vision into everyone's reality. 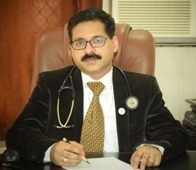 Dr. Abhishek Shukla heads the department of geriatric & palliative medicine, He is an acclaimed geriatrician and academician with a rich experience in the field of geriatric & palliative medicine. 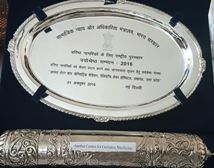 On 1st Oct 2016 Aastha Get National Award -Vayoshreshtha Samman 2016 By Honourable President of India. 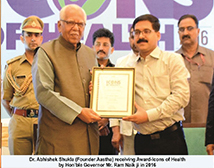 Dr. Abhishek Shukla receiving award Icons of Health by honourable Govrner Shri Ram Naik. Winning Award - Received award for Best Practitioner by Indian Medical Association, Lucknow. 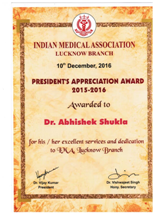 Received award for Best Practitioner by Indian Medical Association, Lucknow.